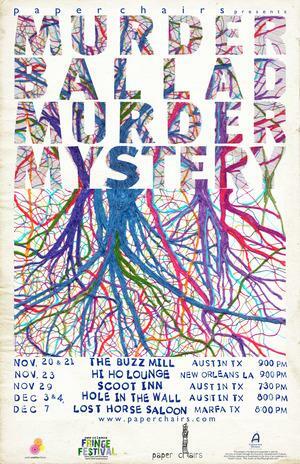 "Murder Ballad Murder Mystery" began its life several years ago, as a site specific work at the Vortex Theater. Since then, its creative team decided to form their own production company. And the play's been condensed and made a little more travel-friendly. The show (as the title implies), is a murder mystery inspired by murder ballads. It will soon hit the road, to be staged in several bars in Austin, as well as stopping at New Orleans and Marfa, Texas. In its current format, it's made to be easily adapted to its venue, so if you're in the audience, it'll feel like the story is unfolding around you inside the bar. The existential whodunit/backwoods hoedown features Kelli Bland, musical director Mark Stewart, writer Elizabeth Doss, Laura Freeman, Ben Ballinger, April Perez Moore, Kim Adams, and Noel Gaulin. After listening to the White Stripes' recording of Robert Johnson's "Stop Breaking Down," playwright Kirk Lynn was inspired to try a cover version of his own. He decided to take on a Shakespeare play. 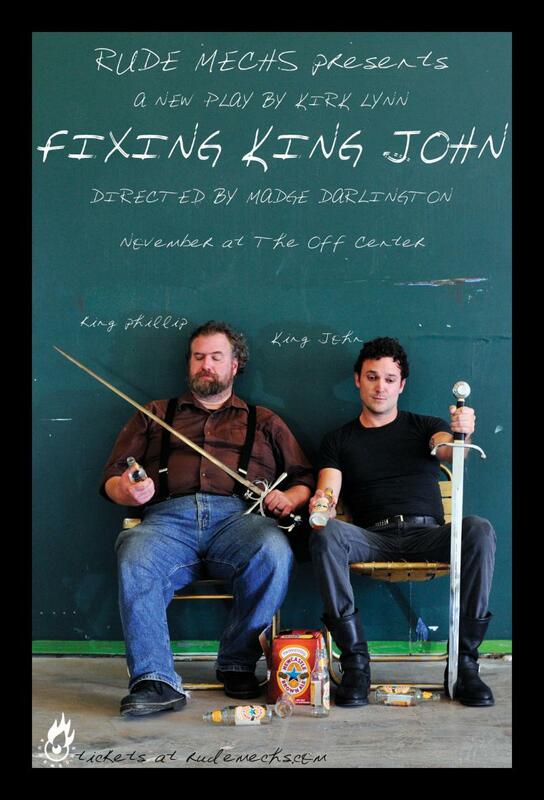 But, reluctant to tamper with one of the greats, he opted to create his own version of what he considered Shakespeare's worst play, "King John." The Cinema Touching Disability Film Festival will celebrate its 10th anniversary this weekend. The festival specializes in "disabilty films," which festival coordinator William Greer defines as a film about, starring, or made by a person with a disabilty. This year, the festival will be headlined by two feature documentaries, "The Crash Reel" and "Getting Up: The Temp One Story." "The Crash Reel" focuses on aspiring Olympic snowboarder Kevin Pearce and his attempts to return to competitive snowboarding after suffering a traumatic brain injury. "Getting Up: The Temp One" Story documents grafiti artist Tempt-One as he learns a new way to practice his art after being paralyzed by the degenerative nerve disorder ALS. Arts Eclectic feature on "Alamo Aftermath"
This November, Crank Collective will debut the second of three Texas history musicals. "Alamo Aftermath: A Texas Revolution Operetta" tells the story of Jose Antonio Menchaca in the time between the Alamo and the battle of San Jacinto. Before people started mispronouncing his name when referring to a street in south Austin, Menchaca was a soldier in the Texas Revolution, a mayor pro tem of San Antonio, and a crusader for the rights of Tejano veterans.